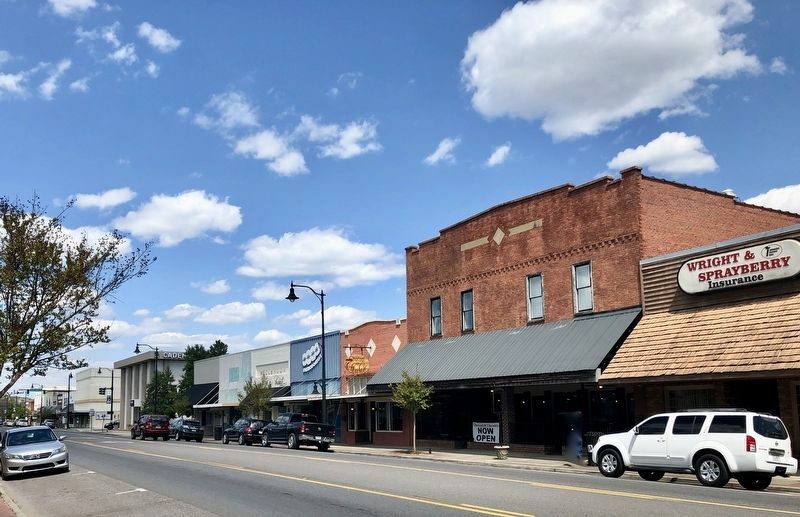 The district contains a collection of late-19th to mid-20th century commercial buildings representing over 60 years of Sylacauga's commercial history. On December 1, 1886, the Anniston and Atlantic Railroad became the first railroad to come through Sylacauga. As a result, the Marble City Land and Furnace Company purchased 300 acres of land where they plotted a new commercial district, located near the new railroad crossing at Broadway and Fourth Street. Known as New Town, this commercial district developed during the 1890s and with the expansion of the railroad, the prosperity of the 1890s brought 20 new commercial establishments to New Town. These businesses consisted of a hotel, livery stable, bank, blacksmith shop, saloon, hardware store, bakery, grocery store, barbershops, and drug stores. 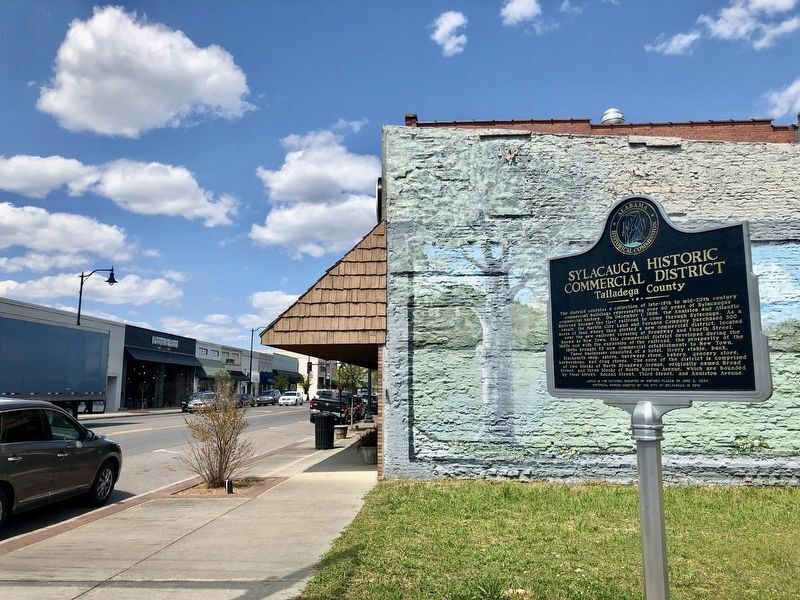 The core of the district is comprised of two blocks of North Broadway Avenue, originally named Broad Street, and three blocks of North Norton Avenue, which are bounded by First Street, Second Street, Third Street, and Anniston Avenue. 2. View of marker and part of historic district along Broadway Avenue. 2019 by the City of Sylacauga. Location. 33° 10.159′ N, 86° 15.038′ W. Marker is in Sylacauga, Alabama, in Talladega County. Marker is at the intersection of North Broadway Avenue (Alabama Route 21) and East 1st Street, on the right when traveling north on North Broadway Avenue. Touch for map. Marker is in this post office area: Sylacauga AL 35150, United States of America. Touch for directions. Other nearby markers. At least 8 other markers are within walking distance of this marker. Sylacauga Cemetery (about 800 feet away, measured in a direct line); a different marker also named Sylacauga Cemetery (approx. 0.2 miles away); Fort Williams (approx. 0.2 miles away); Sylacauga Marble (approx. 0.2 miles away); Hightower Brothers Livery Stable (approx. ¼ mile away); The B.B. Comer Memorial Library (approx. 0.6 miles away); Marble City Cemetery Sylacauga (approx. 0.6 miles away); Sylacauga (approx. 0.9 miles away). Touch for a list and map of all markers in Sylacauga. 3. Sylacauga Historic Commercial from 1st Street towards 2nd Street. More. 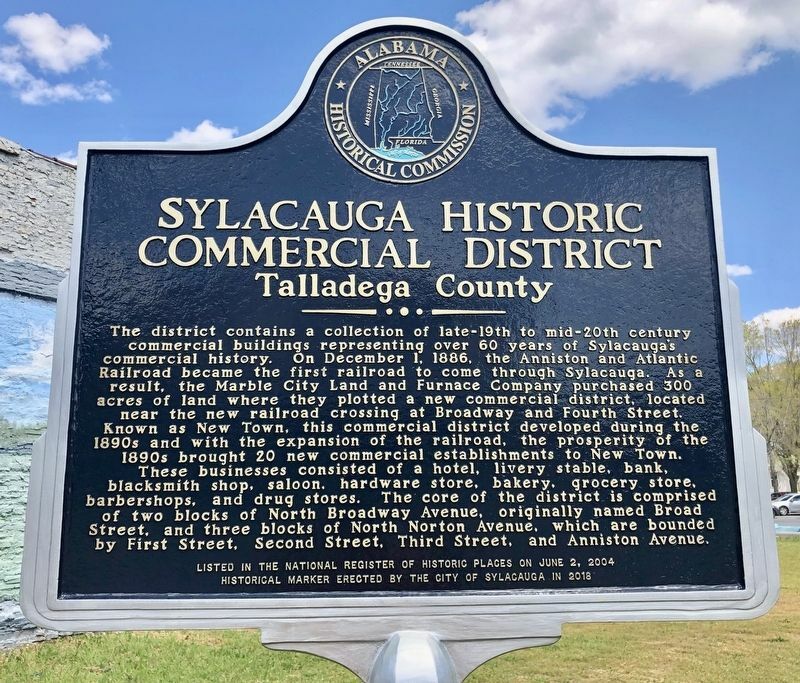 Search the internet for Sylacauga Historic Commercial District. Credits. This page was last revised on April 2, 2019. This page originally submitted on April 2, 2019, by Mark Hilton of Montgomery, Alabama. This page has been viewed 32 times since then. Photos: 1, 2, 3. submitted on April 2, 2019, by Mark Hilton of Montgomery, Alabama.